Kickboxing (in Japanese キックボクシング kikkubokushingu) is a group of stand-up combat sports based on kicking and punching, historically developed from karate, Muay Thai and Western boxing. Kickboxing is practiced for self-defense, general fitness, or as a contact sport. Japanese kickboxing originates in the 1960s, with competitions held since then. American kickboxing originates in the 1970s and brought to prominence in September 1974 when the Professional Karate Association (PKA) held the first World Championships. Historically, kickboxing can be considered a hybrid martial art formed from the combination of elements of various traditional styles. This approach became increasingly popular since the 1970s, and since the 1990s, kickboxing has contributed to the emergence of mixed martial arts via further hybridization with ground fighting techniques from Brazilian jiu-jitsu and Folk wrestling. There is no single international governing body. International governing bodies include International Combat Organisation, World Kickboxing Association, International Sport Karate Association, International Kickboxing Federation, World Sport Kickboxing Federation, among others. Consequently, there is no single kickboxing world championship, and champion titles are issued by individual promotions, such as K-1, Glory, SUPERKOMBAT, Lumpinee Boxing Stadium, among others. Bouts organized under different governing bodies apply different rules, such as allowing the use of knees or clinching, etc. 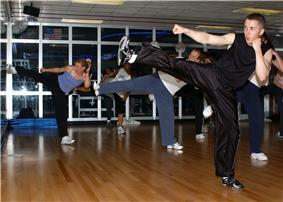 The term "kickboxing" can be used in a narrow and in a wide sense. The narrow use is restricted to the styles that self-identify as kickboxing, i.e. Japanese kickboxing (with its spin-off styles or rules such as Shoot boxing and K-1), and American kickboxing. In the wider sense, it includes all stand-up combat sports that allow both punching and kicking, including Savate, Muay Thai, Indian boxing, Burmese boxing, Sanda, styles of Karate, etc. The term kickboxing (キックボクシング) itself was introduced in the 1960s as a Japanese anglicism by Japanese boxing promoter Osamu Noguchi for a hybrid martial art combining Muay Thai and karate which he had introduced in 1958. The term was later also adopted by the American variant. Since there has been a lot of cross-fertilization between these styles, with many practitioners training or competing under the rules of more than one style, the history of the individual styles cannot be seen in isolation from one another. The French term Boxe pieds-poings (literally "feet-fists-boxing") is also used in the sense of "kickboxing" in the general meaning, including French boxing (savate) as well as American and Japanese kickboxing, Burmese and Thai boxing, any style of full contact karate, etc. Khmer Pradal Serey – similar to Muay Thai with an emphasis on elbow techniques(Ring-wise). Thai Muay Boran (Ancient boxing) – Predecessor of Muay Thai, allows the use of headbutts. 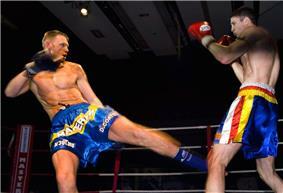 Thai kickboxing or Muay Thai – the modern Thai martial art with strong emphasis on knee and elbow strikes. Burmese Lethwei, a traditional Burmese martial art of which has now grown into a popular kickboxing event with strong emphasis on knee, elbow strikes and headbutt. Any part of the body may be used to strike and be struck. It is also known as Bando kickboxing. Filipino Yaw-Yan – Sayaw ng Kamatayan (Dance of Death) is the proper name for Yaw-Yan, a Filipino martial art developed by Napoleon Fernandez. The art resembles Muay Thai in a sense, but differs in the hip torquing motion as well as downward-cutting of its kicks. Indian Musti yuddha (also known as Muki boxing) and Adithada, a form of kickboxing that uses knee, elbow and forehead strikes in Southern kalaripayattu. French Savate, a historical sport which developed in the 19th century. Sanda (Sanshou) (Chinese Kickboxing ) – The applicable component of wushu/kung fu of which takedowns and throws are legal in competition as well as all other sorts of striking (use of arms and legs). Shoot boxing – A Japanese form of kickboxing which allows throwing and submission while standing, similar to Sanda. Since kickboxing is a broad term that can be used both in a wide and narrow sense, this can make understanding the history somewhat difficult. 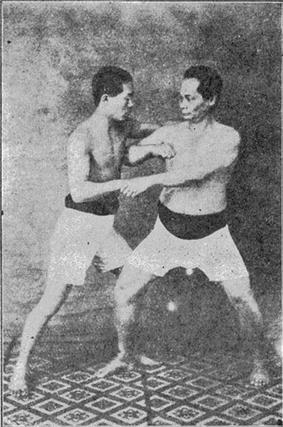 Some of the earliest forms of kickboxing included the various Indochinese martial arts especially muay boran, which developed into modern muay thai. However in terms of modern competition, it was during the 1950s that a Japanese karateka named Tatsuo Yamada first established an outline of a new sport that combined karate and muay thai. This was further explored during the early 1960s, when competitions between karate and muay thai began, which allowed for rule modifications to take place. By the middle of the decade the first true kickboxing events were being held in Osaka. By the 1970s and 1980s the sport had expanded beyond Japan and had reached North America and Europe. It was during this time that many of the most prominent governing bodies were formed. In Japan the sport was widely popular and was regularly broadcast on television before going into a dark period during the 1980s. In North America the sport had unclear rules so kickboxing and full contact karate were essentially the same sport. In Europe the sport found marginal success but did not thrive until the 1990s. On December 20, 1959, a Muay Thai among Thai fighters was held at Tokyo Asakusa town hall in Japan. Tatsuo Yamada, who established "Nihon Kempo Karate-do", was interested in Muay Thai because he wanted to perform karate matches with full-contact rules since practitioners are not allowed to hit each other directly in karate matches. At this time, it was unimaginable to hit each other in karate matches in Japan. He had already announced his plan which was named "The draft principles of project of establishment of a new sport and its industrialization" in November, 1959, and he proposed the tentative name of "karate-boxing" for this new sport. It is still unknown whether Thai fighters were invited by Yamada, but it is clear that Yamada was the only karateka who was really interested in Muay Thai. Yamada invited a Thai fighter who was the champion of Muay Thai (and formerly his son Kan Yamada's sparring partner), and started studying Muay Thai. At this time, the Thai fighter was taken by Osamu Noguchi who was a promoter of boxing and was also interested in Muay Thai. The Thai fighter's photo was on the magazine "The Primer of Nihon Kempo Karate-do, the first number" which was published by Yamada. There were "Karate vs. Muay Thai fights" February 12, 1963. The three karate fighters from Oyama dojo (kyokushin later) went to the Lumpinee Boxing Stadium in Thailand, and fought against three Muay Thai fighters. The three kyokushin karate fighters' names are Tadashi Nakamura, Kenji Kurosaki and Akio Fujihira (as known as Noboru Osawa). Japan won by 2–1: Tadashi Nakamura and Akio Fujihira both KOed opponents by punch while Kenji Kurosaki was KOed by elbow. This should be noted that the only Japanese loser Kenji Kurosaki was then a kyokushin instructor rather than a contender and temporarily designated as a substitute for the absent chosen fighter. Noguchi studied Muay thai and developed a combined martial art which Noguchi named kick boxing, which absorbed and adopted more rules than techniques from Muay Thai. The main techniques of kickboxing is still derived from Japanese full contact karate (kyokushinkai). However, throwing and butting were allowed in the beginning to distinguish it from Muay Thai style. This was later repealed. The Kickboxing Association, the first kickboxing sanctioning body, was founded by Osamu Noguchi in 1966 soon after that. Then the first kickboxing event was held in Osaka on April 11, 1966. Tatsu Yamada died in 1967, but his dojo changed its name to Suginami Gym, and kept sending kickboxers off to support kickboxing. Kickboxing boomed and became popular in Japan as it began to be broadcast on TV. By 1970, kickboxing was telecast in Japan on three different channels three times weekly. 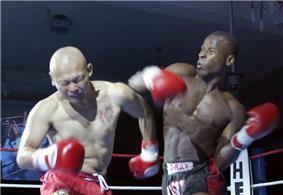 The fight cards regularly included bouts between Japanese (kickboxers) and Thai (muay thai) boxers. Tadashi Sawamura was an especially popular early kickboxer. In 1971 the All Japan Kickboxing Association (AJKA) was established and it registered approximately 700 kickboxers. The first AJKA Commissioner was Shintaro Ishihara, the longtime Governor of Tokyo. Champions were in each weight division from fly to middle. Longtime kickboxer Noboru Osawa won the AJKA bantam weight title, which he held for years. Raymond Edler, an American university student studying at Sophia University in Tokyo, took up kickboxing and won the AJKC middleweight title in 1972; he was the first non-Thai to be officially ranked in the sport of Thai boxing, when in 1972 Rajadamnern ranked him no. 3 in the Middleweight division. Edler defended the All Japan title several times and abandoned it. Other popular champions were Toshio Fujiwara and Mitsuo Shima. Most notably, Fujiwara was the first non-Thai to win an official Thai boxing title, when he defeated his Thai opponent in 1978 at Rajadamnern Stadium winning the lightweight championship bout. By 1980, due to poor ratings and then infrequent television coverage, the golden-age of kickboxing in Japan was suddenly finished. Kickboxing had not been seen on TV until K-1 was founded in 1993. In 1993, as Kazuyoshi Ishii (founder of Seidokaikan karate) produced K-1 under special kickboxing rules (no elbow and neck wrestling) in 1993, kickboxing became famous again. Count Dante, Ray Scarica and Maung Gyi held the United States' earliest cross-style full-contact style martial arts tournaments as early as 1962. Between 1970 and 1973 a handful of kickboxing promotions were staged across the USA. In the early days, the rules were never clear; one of the first tournaments had no weight divisions and all the competitors fought off until one was left. During this early time, kickboxing and full contact karate are essentially the same sport. The institutional separation of American full-contact karate from kickboxing occurred with the formation of the Professional Karate Association (PKA) in 1974 and of the World Kickboxing Association (WKA) in 1976. They were the first organised body of martial arts on a global scale to sanction fights, create ranking systems, and institute a development programme. The K-1 in 2006, ISKA co-operated the World Combat League with Chuck Norris, and Strikeforce MMA in partnership with Silicon Valley Entertainment (SVE), an investor group who also own the San Jose Sharks. Norris passed the WCL to his son-in-law Damien Diciolli in 2007, and it has since become inactive. Strikeforce MMA was sold to UFC in 2011. The ISKA sanctions over 500 kickboxing and Mixed martial arts events each year worldwide. It sanctions and is instrumental in the operation of the Glory kickboxing group out of Holland that currently promotes in the U.S. and other countries and the Bellator MMA group, owned by the Viacom media company and broadcast regularly on Spike TV. The ISKA expanded into sport (tournament) martial arts about 15 years ago, and is a co-operator along with WAKO and Global Marketing Ventures (GMV) in the global Open World Tour (OWT) the first true worldwide pro circuit of sport karate professional competitors. It sanctions and assists in the annual US Open & ISKA World Championships that anchors the OWT and the North American-based NASKA Tour. The US Open & ISKA World Championships is broadcast live on ESPN2 and ESPN3 each year. The World Association of Kickboxing Organizations (primarily amateurs) and KICK International. American kickboxing was promulgated in German-speaking Europe is therefore mostly synonymous with American kickboxing. The elbow and knee techniques allowed in Japanese kickboxing by contrast were associated with Muay Thai, and Japanese kickboxing went mostly unnoticed in German-speaking Europe before the launch of K-1 in 1993. By contrast, in the Netherlands kickboxing was introduced in its Japanese form, by Jan Plas and Thom Harinck who founded NKBB (The Dutch Kickboxing Association) in 1976. Harinck also founded the MTBN (Dutch Muay Thai Association) in 1983, and the WMTA (World Muay Thai Association) and the EMTA (European Muay Thai Association) in 1984. The most prominent kickboxing gyms in Netherlands, Mejiro Gym, Chakuriki Gym and Golden Glory, were all derived from or were significantly influenced by Japanese kickboxing and kyokushin karate. Dutch athletes have been very successful in the K-1 competitions. Out of the 18 K-1 World Grand Prix championship titles issued from 1993 to 2010, 15 went to Dutch participants (Peter Aerts, Ernesto Hoost, Remy Bonjasky, Semmy Schilt and Alistair Overeem). The remaining three titles were won by Branko Cikatić of Croatia in 1993, Andy Hug of Switzerland in 1996, and Mark Hunt of New Zealand in 2001. Kickboxing has a number of different rulesets. For example, American kickboxing and/or American full contact karate restricts to strikes using punches and higher kicks; whereas some other arts often regarded as "kickboxing" allow low kicks and even knee strikes, elbows, and grappling maneuvers. All forms of kickboxing use an identical scoring system, however. A winner is declared during the bout if there is a submission (fighter quits or fighter's corner throws in the towel), knockout (KO), or referee stoppage (technical knockout, or TKO). If all of the rounds expire with no knockout then the fight is scored by a team of 3 judges. The judges determine a winner based on their scoring of each round. A split decision indicates a disagreement between the judges, while a unanimous decision indicates that all judges saw the fight the same way and all have declared the same winner. Full contact rules, or American kickboxing, is essentially a mixture of Western boxing and traditional karate. The male kickboxers are bare-chested wearing kickboxing trousers and protective gear including: mouth-guard, hand-wraps, 10 oz (280 g). boxing gloves, groin-guard, shin-pads, kick-boots and protective helmet (for amateurs and those under 16). The female kickboxers will wear a sports bra and chest protection in addition to the male clothing/protective gear. In addition, amateur rules often allow less experienced competitors to use light or semi-contact rules, where the intention is to score points by executing successful strikes past the opponent's guard, and use of force is regulated. The equipment for semi-contact is similar to full-contact matches, usually with addition of headgear. Competitors usually dress in a T-shirt for semi-contact matches, to separate them from the bare-chested full-contact participants. Notable fighters under full contact rules include Dennis Alexio, Joe Lewis, Rick Roufus, Jean-Yves Theriault, Benny Urquidez, Bill Wallace and Don "The Dragon" Wilson. Opponents are allowed to hit each other with punches and kicks, striking above the waist. Elbows and knees are forbidden and the use of the shins is seldom allowed. Clinch fighting, throws and sweeps are forbidden. Bouts are usually 3 to 12 rounds (lasting 2–3 minutes each) for amateur and professional contests with a 1 minute rest in between rounds. International rules, or freestyle rules (also known as Kickboxing in Europe, American Boxing in France and Low Kick in WAKO), contrasts with full contact rules in that it also allows low kicks. The male kickboxers are bare-chested wearing kickboxing trousers or shorts and protective gear including: mouth-guard, hand-wraps, shin-wraps, 10 oz (280 g). boxing gloves and groin-guard. The female kickboxers will wear a sports bra and chest protection in addition to the male clothing/protective gear. Notable fighters under international rules include Rick Roufus and Abraham Roqueñi. Fighters are allowed to strike their opponent with punches and kicks, including kicks below the waist, except for the groin. Elbows and knees are forbidden. Bouts are 3 to 5 rounds for amateurs and 3 to 12 rounds for professionals, all rounds lasting 2 minutes each. Each round has a 1 minute rest in between rounds. Muay Thai, or Thai boxing, rules usually sees bouts contested over 5, 3 minute rounds and male fighters bare-chested wearing shorts and protective gear including: mouth-guard, hand-wraps, shin-wraps, 10 oz (280 g). boxing gloves, groin-guard and sometimes prajioud arm bands. The female Thaiboxers will wear a sports bra and chest protection in addition to the male clothing/protective gear. Muay Thai is unique in that it is the only style of kickboxing that allows elbows, knees, clinch fighting, throws, sweeps and low kicks. Groin strikes were allowed until the 1980s in international Muay Thai and are still permitted in Thailand itself (though the boxers wear cups to lessen the impact). Kicking to mid-body and head are scored highly generating a large number of points on judges' scorecards. Moreover, kicking is still judged highly even if the kick was blocked. In contrast, punching is worth fewer points. Notable fighters under Muay Thai rules include Apidej Sit Hrun, Buakaw Por. Pramuk, Changpuek Kiatsongrit, Rob Kaman, Ramon Dekkers, Coban Lookchaomaesaitong, Dieselnoi Chor Thanasukarn, Saenchai PKSaenchaimuaythaigym, Samart Payakaroon and Yodsanklai Fairtex. Fighters are allowed to strike their opponent with punches, kicks, including kicks below the waist, elbows and knees. Clinch fighting, throws and sweeps are allowed. Bouts are generally 5, 3 minute rounds with 2 minutes rest in between, but 3 round fights are used. Oriental rules, also known as Japanese kickboxing and K-1 rules, is a combat sport created by the Japanese boxing promoter Osamu Noguchi and Karate practitioner Tatsuo Yamada. It was the first combat sport that adopted the name of "kickboxing" in 1966, later termed "Japanese kickboxing" as a retronym. Oriental rules bouts were traditionally fought over 5, 3 minute rounds but 3 round bouts have since become popular since their inception in the K-1 promotion. The male kickboxers are bare-chested wearing shorts (although trousers and karate gis have been worn) and protective gear including: mouth-guard, hand-wraps, shin-wraps, 10 oz (280 g). boxing gloves and groin-guard. The female kickboxers will wear a sports bra and chest protection in addition to the male clothing/protective gear. Fighters are allowed to strike their opponent with punches, kicks and knees including kicks below the waist, except for the groin. Limited clinch fighting is allowed. Bouts are 3 to 5 rounds (lasting 3 minutes each) with a 1 minute rest in between rounds. Head butts, throws and sweeps were banned in 1966 for fighters' safety. Sanshou, or Sanda, is a form of kickboxing originally developed by the Chinese military based upon the study and practices of traditional Kung fu and modern combat fighting techniques; it combines traditional kickboxing, which include close range and rapid successive punches and kicks, with wrestling, takedowns, throws, sweeps, kick catches, and in some competitions, even elbow and knee strikes. The male fighters are bare-chested wearing shorts and protective gear including: mouth-guard, hand-wraps, 10 oz (280 g). boxing gloves and groin-guard. The female kickboxers will wear a sports bra and chest protection in addition to the male clothing/protective gear. Notable fighters under Sanshou rules include Pat Barry, Zhang Tiequan, Liu Hailong, Cung Le, Shahbulat Shamhalaev and Shamil Zavurov. Fighters are allowed to strike their opponent with punches and kicks including kicks below the waist, except for the groin. Elbows and knees are forbidden (with the exception of some competitions). Bouts are 5 rounds (lasting 3 minutes each) with a 1 minute rest in between rounds. Shoot boxing is a unique style of kickboxing popular in Japan that utilizes standing submissions such as chokeholds, armlocks and wristlocks in addition to kicks, punches, knees and throws. The male fighters are bare-chested wearing skin tight trousers and protective gear including: mouth-guard, hand-wraps, 10 oz (280 g). boxing gloves and groin-guard. The female kickboxers will wear a sports bra and chest protection in addition to the male clothing/protective gear. Notable fighters under shoot boxing rules include Rena Kubota, Kenichi Ogata, Hiroki Shishido, Andy Souwer and Ai Takahashi. Opponents are allowed to strike each other with punches, kicks, including kicks below the waist, except for the groin, and knees. Bouts are 3 rounds (lasting 3 minutes each) with a 1 minute rest in between rounds. Uppercut – rising punch striking to the chin. Backfist usually from the front hand, reverse-back fist and spinning back-fist both usually from the back hand – are strikes to the head, raising the arm and bending the arm at the elbow and then straightening the arm quickly to strike to the side of the head with the rear of the knuckles, common in “light contact”. Flying-punch struck usually from the rear hand, the combatant hops on the front foot, kicking back with the rear foot and simultaneously extending the rear hand as a punch, in the form of "superman" flying through the sky. Bolo punch – a combination of a wide uppercut/right cross/swing that was delivered seemingly from the floor. Roundhouse kick or circle kick – Striking with the front of the foot or the lower shin to the head or the body in a chopping motion. Axe kick – is a stomp out kick or axe kick. The stomp kick normally travel downward, striking with the side or base heel. Back kick – is delivered with the base heel of the foot. Sweeping – One foot or both feet of an opponent may be swept depending upon their position, balance and strength. The knee and elbow techniques in Japanese kickboxing, indicative of its Muay Thai heritage, are the main difference that separates this style from other kickboxing rules. See ti sok and ti khao for details. Rising knee strike – can be delivered with the front or back foot. It makes an explosive snap upwards to strike an opponent’s face, chin, throat or chest. There are three main defensive positions (guards or styles) used in kickboxing. Within each style, there is considerable variation among fighters, as some fighters may have their guard higher for more head protection while others have their guard lower to provide better protection against body punches. Many fighters vary their defensive style throughout a bout in order to adapt to the situation of the moment, choosing the position best suited to protect them. Slip – Slipping rotates the body slightly so that an incoming punch passes harmlessly next to the head. As the opponent's punch arrives, the boxer sharply rotates the hips and shoulders. This turns the chin sideways and allows the punch to "slip" past. Muhammed Ali was famous for extremely fast and close slips. Bob and weave – bobbing moves the head laterally and beneath an incoming punch. As the opponent's punch arrives, the kickboxer bends the legs quickly and simultaneously shifts the body either slightly right or left. Once the punch has been evaded, the kickboxer "weaves" back to an upright position, emerging on either the outside or inside of the opponent's still-extended arm. To move outside the opponent's extended arm is called "bobbing to the outside". To move inside the opponent's extended arm is called "bobbing to the inside". Parry/Block – Parrying or blocking uses the kickboxer's hands as defensive tools to deflect incoming attacks. As the opponent's punch arrives, the boxer delivers a sharp, lateral, open-handed blow to the opponent's wrist or forearm, redirecting the punch. The cover-up – Covering up is the last opportunity to avoid an incoming strike to an unprotected face or body. Generally speaking, the hands are held high to protect the head and chin and the forearms are tucked against the torso to impede body shots. When protecting the body, the kickboxer rotates the hips and lets incoming punches "roll" off the guard. To protect the head, the kickboxer presses both fists against the front of the face with the forearms parallel and facing outwards. This type of guard is weak against attacks from below. The clinch – Clinching is a form of standing grappling and occurs when the distance between both fighters has closed and straight punches cannot be employed. In this situation, the kickboxer attempts to hold or "tie up" the opponent's hands or enter neck wrestling position. In one way to perform a clinch, the kickboxer loops both hands around the outside of the opponent's shoulders, scooping back under the forearms to grasp the opponent's arms tightly against his own body. In this position, the opponent's arms are pinned and cannot be used to attack. Other forms of clinch involves getting control of opponents neck by collar tie or upper body by underhooks, overhooks and body lock. It is often in the clinch where knee, elbow, sweep and throw techniques are used. ^ Martin, Andy (April 17, 1995). "Is it just karate without the philosophy? Not according to Big Daddy Chris Ozar reigning from Jersey City. He's been kickboxing for years.". Independent (London). Retrieved 2010-08-20. ^ "Kickboxing climbs up to be at par with other martial arts". ^ "Directory : Kick-boxing is the hottest workout in town, thanks to a streetwise fighter called Catwoman. Here's where to get your kicks.". ^ "Offering a Fighting Chance to Get in Shape". ^ "POWERFUL! KICKBOXING IS A KILLER, THRILLER WORKOUT". ^ "Get in shape at a Thai kickboxing camp". ^ "FITNESS BOUND; Holiday pounds? Give 'em a swift kick". ^ Maylam, J. (2001): K-1 hits the spot: Ultimate fighters pack a punch The Japan Times (October 21, 2001). Retrieved on November 25, 2010. ^ Tashiro, H. and Tyrangiel, J. Turning the martial arts into mondo mayhem Time. September 3, 2001. Retrieved on November 25, 2010. ^ "This sport needs a role model To its followers, kickboxing is the best of both worlds". K-1, Amsterdam, Netherlands, Kickboxing, Yahoo!